Northrop Grumman Corp.’s NOC business segment, Aerospace Systems, recently clinched a modification contract related to the Airborne Laser Mine Detection System (ALMDS) program. Work related to this deal is scheduled to be over by June 2020. Valued at $15.3 million, the contract was awarded by the Naval Sea Systems Command, Washington, District of Columbia. Per the terms of the agreement, the company will provide fabrication, integration, testing, system production and delivery of peculiar support equipment for the ALMDS program. Majority work for the contract will be executed in Melbourne, FL. Northrop Grumman will utilize fiscal 2018 other procurement (Navy) and fiscal 2017 other procurement (Navy) fund to finance the task. The purpose of ALMDS is to detect, classify and localize near-surface, moored sea mines. Notably, it is integrated with Lockheed Martin’s MH-60S helicopter to offer rapid, wide-area reconnaissance and assessment of mine threats in littoral zones, confined straits, choke points and amphibious objective areas. ALMDS is also capable of day or night operations without stopping to stream out or recover equipment.In addition, it provides accurate target geo-location to support follow on neutralization of the detected mines. Inexpensive and easily deployable mines have been disrupting port and maritime operations as well as preventing naval forces from achieving sea control and power projection ashore. In this context, Northrop Grumman’s ALDMS plays an instrumental role by addressing the U.S. Navy’s immediate need to protect its sea-based assets from the ever-increasing threat of mines. In fact, we believe that Northrop Grumman possesses significant upside potential based on the U.S. government’s increased focus on intelligence, surveillance and reconnaissance (ISR) programs. In first-quarter 2018, revenues from the company’s Aerospace Systems unit totaled $3.28 billion, which increased 9.9% year over year. We believe the latest contract along with the other notable ones that the company has secured in recent times should allow its Aerospace Systems unit to reflect similar solid results in upcoming quarters as well. Moreover, the recently approved fiscal 2019 defense budget provisions for an investment plan of $13.7 billion for science and technology, including the ISR Programs. Considering such favorable budgetary revisions, we expect the company to win more such contracts, like the latest one, in the days ahead. In a year’s time, Northrop Grumman has gained about 21.8% compared with the industry’s rally of 29.5%. The underperformance may have been caused by higher operating expenses that the company has been incurring lately. 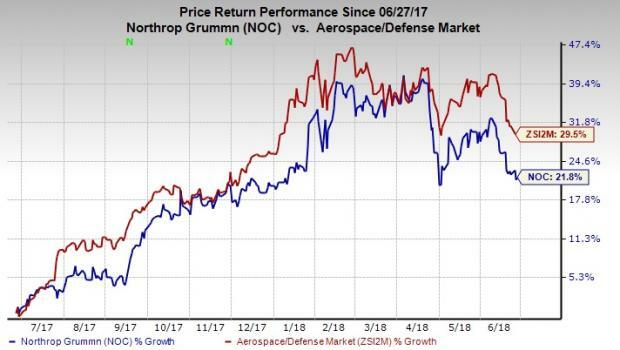 Northrop Grumman currently sports a Zacks Rank #1 (Strong Buy). Some other top-ranked stocks in the same space include Boeing BA, Textron TXT and Wesco Aircraft Holdings WAIR. All these three stocks carry a Zacks Rank #2 (Buy). You can see the complete list of today’s Zacks #1 Rank stocks here. Boeing delivered an average positive earnings surprise of 29.51% in the last four quarters. The Zacks Consensus Estimate for 2018 earnings moved north 4.4% to $14.67 in the last 90 days. Textron came up with an average positive earnings surprise of 16.64% in the last four quarters. The Zacks Consensus Estimate for 2018 earnings climbed 2.94% to $3.15 in the last 90 days. Wesco Aircraft Holdings’ long-term growth rate is pegged at 12%. The Zacks Consensus Estimate for 2018 earnings moved up 10% to 77 cents in the last 90 days.